It's probably a good thing all my favorite people from history are dead. Actually, I know it's a good thing because it wouldn't take long for me to be arrested for lurking in the bushes outside their houses. 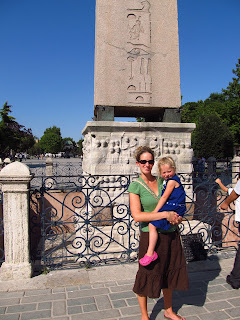 (Or palaces, in the cases of Theodora and Hatshepsut). Last summer I got to stalk Theodora when I went to Istanbul. I figured it was probably time to get around to sharing some of that stalking. (Yes, I'm trying to make you all accomplices. Just go with it). 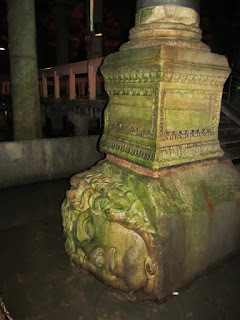 A giant Medusa pillar in the Basilica Cistern. Justinian (Theodora's husband) pilfered columns from all over the empire to build this. Inside the Hagia Sophia. 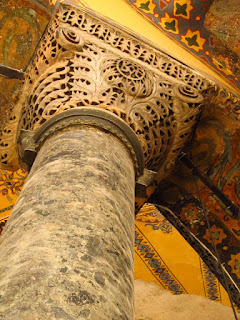 The monogram on that pillar is either Justinian's or Theodora's. If I built the biggest church in the world (at the time) I'd put my initials all over it too. Modesty is highly overrated. 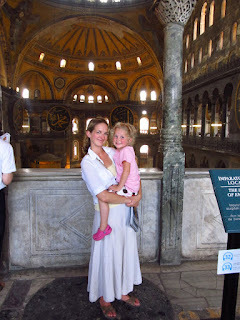 The Empress and Empress-in-Training in the Empress' box at the Hagia Sophia. All we needed was a throne. Recently discovered floor mosaics from the Sacred Palace. Yes, that means Theodora would have walked here. (And yes, I drooled over these). The Egyptian obelisk of Tutmose III from the Hippodrome. The obelisk was swiped from Egypt (obviously), but the base shows the Byzantine Emperor Theodosius watching the chariot races. Ancient Egypt in Byzantium? SO COOL! That's it for now. I'm pretty excited because it looks like I get to go back to Istanbul for a couple days this summer. More stalking! DISCLAIMER: I promise not to stalk anyone unless they're already dead. Then they're fair game. And no zombies either. That's just weird.